These are last week's blocks. I guess I'm a little bit behind but right now I'm focusing on sewing for fun and not a schedule. It's a nice change after the busy holiday season! I've been busy making some other things too. 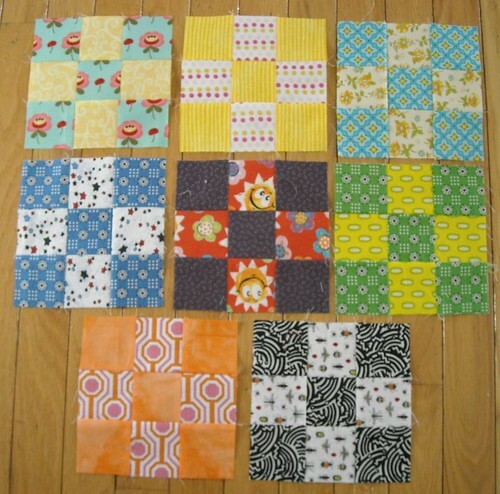 Mostly quilt blocks. Sometimes I think I like making individual blocks more than making whole quilts. Maybe it's just the (nearly) instant gratification that I like. When the Goodnight Monkey fabric came out I decided I wanted to use it to make a twin-size quilt for Jacob. 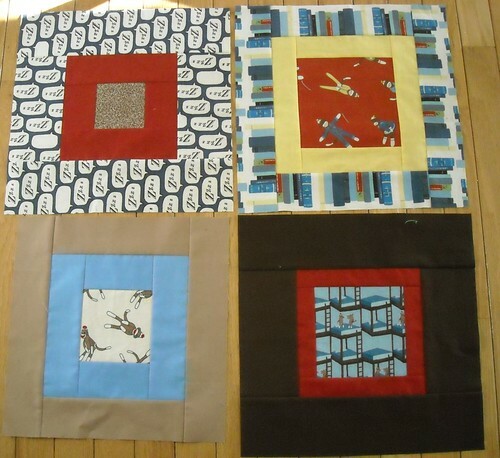 I really enjoyed making quilts with 12" blocks last year and decided to make his quilt with large blocks. I did some math and figured that with 13" (finished measurement, they sew up at 13.5") blocks, I can make a twin size quilt with 35 blocks. I decided to make the quilt blocks in a square-in-a-square style, no wonkiness or crookedness because he likes things straight and neat. I drew out a few different blocks with varying measurements but my diagrams had the finished measurements written on them. On that lower left block there I forgot to add the 1/2" I needed for seam allowance to the outer square. Oops! I think I'll redraw my diagrams with the cutting numbers instead of the finished numbers. 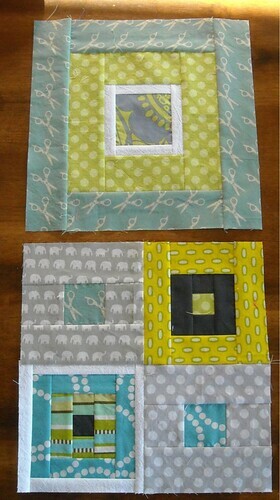 And... here are my last two bee blocks for 2010. Finally, here's a sneak peek of my no prints allowed Kona solids quilt. I think I'm keeping it a secret until March. So far it has been fun and I like what I've done! I'd love to hear about what you're making. Are you having fun sewing without a time crunch? Nine Patches.. simple and sweet! I like how you combine fabrics. They always look so clear and bright. Sometimes I like just sewing blocks, too. And the scrappier the better. 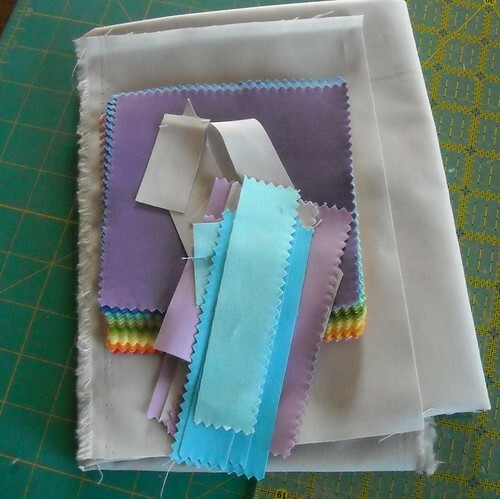 It's just fun to see how fabrics look together, with no particular plan in mind for the blocks. Good job keeping up with your 9 patches! Love you bee blocks! Very pretty colors. What a great challenge with a no prints allowed. I am just now learning about the Kona solids and how awesome they are!